UPDATE: After local food truck owners (represented by the newly formed Greater Spokane Food Truck Association) voiced concerns at tonight's meeting about the cost of the proposed mobile food vending permit, the Spokane City Council voted to defer the ordinances for one month. Councilman Mike Allen said he would work with city planning staff and food truck owners to consider changes to the ordinances before they come back to the council. ORIGINAL POST: More than a year after starting a review of the city’s food truck laws, city staff have proposed new regulations on which the Spokane City Council will vote tonight. Last spring, a growing number of food trucks emerged, complaining of confusing city rules that were only sometimes enforced. One especially awkward rule required that food trucks move every 10 minutes if they were operating in public right of way, like in an on-street parking space. “What the City of Spokane has decided is to be proactive, to look at current regulations. What do they allow and how do they work in light of the modern mobile food vending industry? What we’ve found is they don’t really work that well,” city planner Andrew Worlock told the Inlander last year. At open houses and hearings throughout the summer, food truck owners agreed that the existing regulations needed an overhaul but some worried that new rules, like a proposal to require food trucks to pay for each location where they want to park, would be an impossible burden. 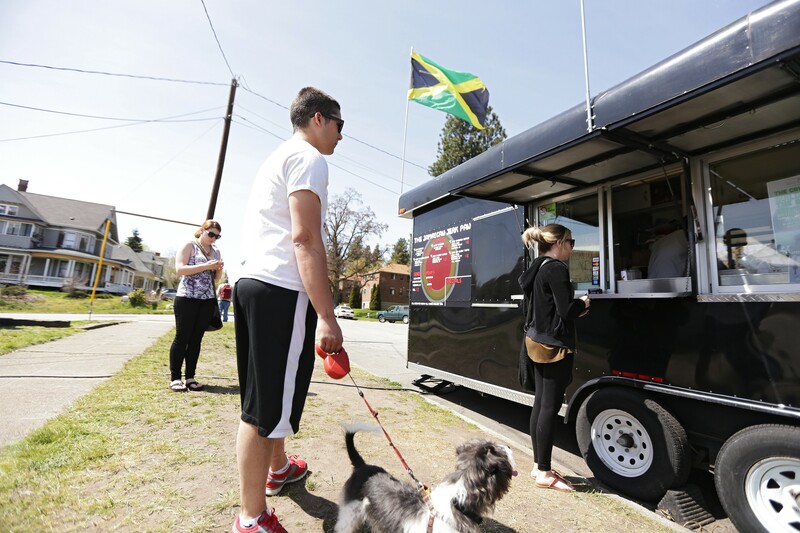 “You can’t regulate spontaneity,” said Sabrina Sorger, who along with her husband owns the Jamaican Jerk Pan food trailer, a Browne’s Addition regular. Now, with the weather rapidly warming and the city actively promoting food truck culture, the new rules will be put to the test. Food trucks must have written consent from the adjoining private property owner to use any location where they plan to vend. They must comply with all parking regulations, including paying meters. There must at all times be a five-foot pedestrian pathway along the sidewalk next to the truck. Food trucks must operate at least 75 feet from the entrance of existing restaurants, unless they have the written consent of the restaurant owner. Trucks serving entirely on private property must have the permission of the property owner and remain entirely self-contained and not offer drive-through service. Trucks vending in or next to city parks must have the written permission of the city’s park board. As per state law, food trucks are not allowed to sell liquor. Vendors who don’t follow the requirements will be ticketed. These rules do not change the health and safety regulations on food trucks, which are handled by the state and Spokane Regional Health District. The license application is $40 plus $10 for each proposed location; the annual renewal fee is $40 and $10 each for any new locations. Food trucks would also be required to pay $90 a year toward the Parking and Business Improvement Area, a self-taxing district where business owners’ dollars go toward marketing, cleaning, parking programs, special events and security in downtown. The rules would not apply to caterers (who only serve at special events), trucks that operate for six days or fewer per year or those who sell only prepackaged food or vend from small pushcarts on the sidewalk and move at least every 10 minutes.